It’s summer in the city…which means that you’ve got underutilized orchestra musicians, choral singers, and conductors, because their seasons run from September to May. You’ve got outdoor concert spaces just crying out for events, and you’ve got audience members looking for fun things to do. If you’re Boston, you bring together choristers from almost all 23 of the city’s neighborhoods (as well as cities and towns up to an hour away) along with outstanding orchestral players, superb conductors…and you put on a show. 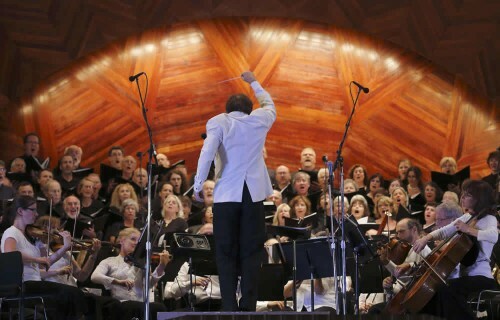 This year, the Boston Landmarks Orchestra and the One City Chorus will perform the Verdi Requiem in front of an audience of upwards of 6,000 on Boston’s famed Hatch Shell on Wednesday, August 1 at 7 p.m. (rain date August 2). What makes this concert unique – and what makes it a model for any music-loving city across the country – is that the Landmarks Orchestra exists only during the summer and One City Chorus comes together for only a single night. What makes the One City Chorus unique is that anyone can join. No auditions. If you’ve always wanted to sing great music in front of thousands of people, you’ve come to the right place. Connors’ first experience with the One City Chorus was as a chorister. So the question becomes this: how can other cities benefit from the conductors, professional and amateur musicians in their midst, the venues that could host great event, and the audiences that would love to attend? You start with great conductors. Christopher Wilkins, maestro of the Boston Landmarks Orchestra, set a goal of attracting singers from all of Boston’s neighborhoods. Since Wilkins and the Landmarks Orchestra are performing weekly through the summer, the role of preparing the One City Chorus falls upon Scott Allen Jarrett, Music Director of Boston’s highly regarded Back Bay Chorale and widely regarded as the best young choral conductor in the United States. “The role of the person who’s going to prepare the chorus is crucial,” notes Wilkins. “Scott has a really good sense of how to speak to everybody in the room. He has Tanglewood Festival Chorus veterans there, and he has other people who are seeing the performing subculture the very first time. And that’s a hard thing to do. putting it all together with very little time, outlining the goals for the singers, and rousing them to the task. “Our singers understand what a special opportunity and experience this will be, and they’re willing to put in the extra work outside of rehearsal to make it all possible for themselves, their fellow choristers, and our wonderful audience. Working with first-time choristers on a piece of the scope of the Verdi Requiem is no small job, Jarrett notes. “I recall my first conducting teacher telling us, ‘There are no bad choirs, only bad conductors!’ It’s my job to very quickly establish a goal for the sound and give all choristers a way to achieve that together. So how do you find the singers? Next, you need a great venue. Boston is fortunate in that the Landmarks Orchestra has the full support of the office of Boston Mayor Marty Walsh and gets to use the extraordinary Hatch Shell, thanks to the Massachusetts Department of Conservation, midway between the Back Bay skyline and the sparkling water of the Charles River. And then you need money. The Boston Landmarks Orchestra receives funding from various foundations and individuals. Somebody’s got to pay the musicians, rent the rehearsal space, provide security, and so on. What’s Susan Graham Thinking Just Before She Sings For Thousands?